U.S. stocks ended mostly lower Friday, as an outsized earnings miss by a leading online retailer rattled global investors, offsetting optimism from an in-line second quarter GDP report. Only the Dow Industrials ended positive on Friday and for the week, reaching new all-time highs for three consecutive sessions. The S&P 500 and NASDAQ Composite both snapped three weeks of gains, albeit ending just fractionally lower. Even as the majority of technology mega caps posted street-beating earnings, a number reported varying degrees of either soft revenue and/or lackluster forward guidance, sending the NASDAQ 100 down 0.2% for the week and 0.7% below its Wednesday record high. In another sign of Wall Street’s tech jitters, around $2.5 billion was withdrawn last week from the largest ETF that tracks the NASDAQ 100. Outflows accelerated on Wednesday, the day the VIX Volatility Index reached its longest period of record low volatility, a tenth day the index traded below a 10 level. 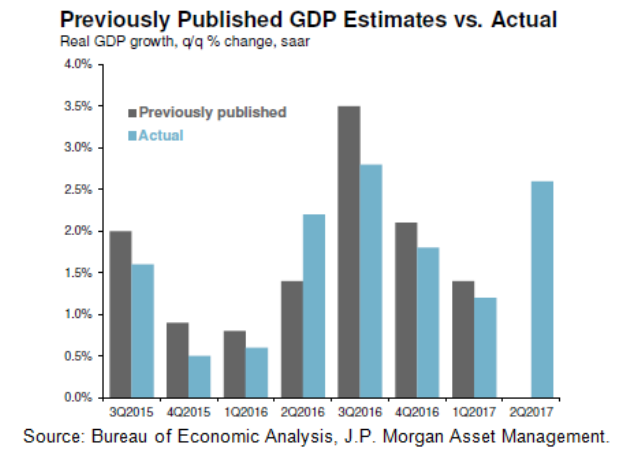 On Friday, the Commerce Department released its first of three estimates of second quarter GDP growth, coming in at 2.6%, which is more than double the 1.2% pace of first quarter growth, which was downwardly revised from 1.4%. For the week, the S&P 500 fell less than one point for a fractional -0.0013% loss, the Dow Industrials advanced +1.16%, and the MSCI EAFE (developed international) rose +0.23. After a slow-growth start to the year, U.S. economic growth handily accelerated in the second quarter. Data released last week showed real annualized GDP growth of 2.6% in the second quarter of 2017 – over twice as fast as in the first quarter – driven by healthy contributions from both consumption and nonresidential investment. However, growth in six of the past seven quarters was revised lower and, while these revisions still leave average growth during the expansion at 2.1%, this pace has not been enough to trigger an acceleration in wages, as evidenced by weak growth in Friday’s employment cost index report. The apparent failure of health care reform keeps in place the taxes devoted to paying for the so-called Affordable Care Act, while recent statements from Congressional and Trump administration officials are suggesting later and smaller fiscal stimulus than what was expected immediately after the election. According to J.P. Morgan, overall, recent data suggest a reduced risk of economic overheating. While this could support continued moderate gains for equities and only modest increases in interest rates, high valuations in both U.S. stocks and bonds, combined with lukewarm U.S. economic growth, underscore the importance of international diversification.